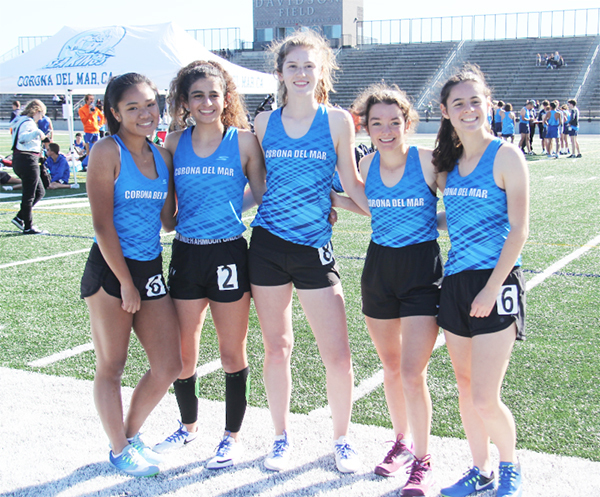 Every spring, the Corona del Mar Track & Field program looks forward to its “Battle of the Bay” dual meet with Newport Harbor High School. The NHHS athletes may look familiar to you, because they have been without a track for the past 2 years, practicing at CDM’s track in the interim of their track being constructed. We had the privilege of being the first track meet held at the new, state of the art facility at NHHS, AND the thrill of winning all 4 of our BOTB contests for the Varsity Girls, Varsity Boys, JV Girls and JV Boys. For those of you new to Track & Field, the first 3 finishers in each event are awarded points: 1st place receives 5 points, 2nd place receives 3 points, and 3rd place receives 1 point. Relays are 5 points to the winner, and 0 points to the losing team in that contest. The scores are added up and that is how the TEAM SCORES are calculated. CDM had 91 Top 3 Finishes across all events! Congratulations to all Sea King athletes who are getting a great start to the season. The “PR” notation is for Personal Records (PR’s) set through the season. You begin to note PR’s from your second event forward, so look for many PRs to be set from the next meet and on, as this was the first meet for many of our athletes. Thank you to the parents that brought waters and snacks to this meet: Gordon Kennedy (who also posts photos on Facebook) , Brigid Cianfrani and Patty Seyburn. We have the Laguna Trophy Track & Field Invitational (Select Athletes) this Saturday, March 17th. Coach will be in touch with these athletes and inform them of their scheduled time for competing. Our first Pacific Coast League meet against Beckman High School (ALL athletes) will be on Thursday, March 22 at CDM. We hope to see many of you at our track to support our Sea Kings! PLEASE RESPOND TO THIS EMAIL IF YOU CAN HELP BRING WATERS OR SNACKS. Thank you! Morgan Simon 12-01.00 1st PR NEW CDM SCHOOL RECORD! !